Mena, Rachlin, and BSO pitched a peculiarly bonded appointment with Haydn, Mendelssohn, and Janáček. 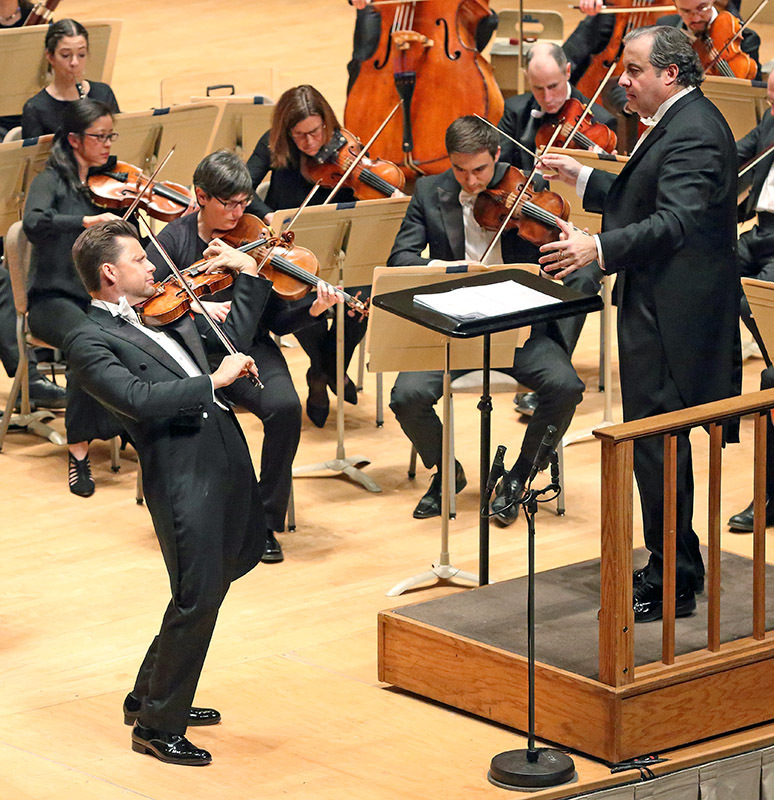 The 43-year old Lithuanian-born Julian Rachlin, standing at 83rd among “The World’s Greatest Violinists,” should certainly rise in ranking after his appearance Thursday evening at Symphony Hall. Boston’s audience loved him. From Juanjo Mena on the podium stemmed an organic approach that would lead to sound-structure substance. Haydn’s Symphony No. 44, his Trauersinfonie, or Mourning Symphony, became more or less a quest for the single statement under guest conductor Juanjo Mena. Haydn’s classical antecedent- consequent phrasing ascended from a simpler question and answer with Mena melding shorter phrases, the result being a large seamless outcome. Mena shaped a forceful four-note figure, a motto of sorts, in the first movement and played with dynamic contrasts. Yet Mena’s all-in-one Allegro con brio grounded Haydn’s nifty shifts. With Haydn come surprises. In this symphony, the usual third movement minuet came earlier. The trio could have been another surprise, but Mena played that down. Finely molded lines in strict canon took over. This was a very repetitious, near-boring iteration of the second movement. In the Adagio, Mena often looked to the first violins, hands painting the melody that Haydn so adored. In the Finale: Presto, as with the rest of the symphony, the aesthetic of heightened emotionalism, or Sturm und Drang, gave way to more oneness. Julian Rachlin hears in Mendelssohn a “charming person not an angry man” one full of inspiration, joy. Near the hand-held portion of the bow Rachlin would draw weightlessness opposite of the expected. Rather than exacting intonation, Rachlin would reach out for sunshine where shade often spreads. That is Rachlin’s melodic Mendelssohn the Boston audience heard throughout the Violin Concerto in E Minor. Remarkably, the Allegro Molto Appassionato, rapid passage work popped with certain exuberance under Rachlin’s deft fingers. During moments of orchestral intervals, Rachlin reacted with a bit of body bobbing. These rare instances only heightened the benevolence pervading this Mendelssohn. And the cadenza, as with Rachlin’s entire concerto musing, lit up with virtuosic restraint, still more humanity pouring out of his violin. High harmonics on the E string somehow astonishingly allied with the lowest notes on the G string. Still more, his is not a big sound. Warmth abounded in the Andante. For the finale, first in minor then in major, Rachlin had to be thinking of a “celebration of joy,” his own words. Goodbye to brilliance and hello to feathery, whimsical, out-of-this world playing, ingenious in concept and execution. Julian Rachlin steered Mena and the BSO clear of sentimentality to share higher aims. Embracing optimism and assurance clearly separates this violinist from today’s crowded field of artists swept up with I can play it faster. Rachlin truly is filling a vacuum. He had Boston’s audience standing and cheering. On a night where a polar vortex kept some from attending, those who were at Symphony Hall would, no surprise, would vote—with their cheers and shouts— this magnificent artist way up in the polling charts of all-time great violinists. The BSO, too, touched deeply. An ultimate fineness, an extraordinary transparency akin to chamber playing wondrously complemented Rachlin. Next, awakened brass with tympani stirred up the opening fanfare of Janáček’s Sinofonietta to spine-tingling effect. In “The Castle, Brno,” the BSO threw a sudden royal low-roar scare, startlingly shifted to fearsome festivity, morphed to the pastoral, and warmed to the romantic. Later, BSO delivered waves of strings, brass fanfares and rocketing woodwinds. “Town Hall”—where Hitchcock thrillers perhaps got mileage out the composer’s 1926 work —missed such suspense. The audience applauded enthusiastically it appeared more for the impeccable and refined BSO than, perhaps, for Janáček’s travelogue of the militaristic and festive. 1) Juanjo Mena is really underrated. I’ve now heard 3 or 4 concerts he’s conducted with the BSO, and they have never been anything less than wonderful. I still remember his performance several years ago of Schubert’s 9th, the best I’ve ever heard. I hope we hear a lot more of him in the years to come. There are few guest conductors of his generation that I enjoy more. 2) Neither we nor others in our row, all regular attendees, thought a whole lot of Julian Rachlin. His vibrato is so wide that it’s challenging to listen to. He doesn’t have a big sound a la Vadim Repin. I did not care for his grimaces, body jerks, and visual performance. That aspect of his playing felt cheap, distracting, and divorced from what I actually heard. Unlike David Patterson, I think his ranking on the list arguably should go down, not up. If the BSO does book him again, we’ll probably trade out of that concert unless we really want to hear the rest of the program. 3) The BSO had a really good night on Thursday. The playing throughout was gorgeous, especially the Haydn and the violin concerto. I really enjoyed the Sinfonietta, although it’s a piece I’ve only heard in recording a few times before. But this performance was very engaging. However does Mr. Patterson know what the audience was applauding at the conclusion of Jancek’s Sinfonietta? I was applauding for both the BSO’s virtuosic performance and the piece itself, which I had never heard in a live performance. I’d prefer the reviewer just state his opinion rather than inferring the audience shares it. I agree with Mr. Johnson. The Janáček pieces were for me the highlight of this concert, particularly the Sinfonietta which I had heard live only once before (but performed then by a ballet orchestra). But where were the BSO regular trumpeters? Also, it was good to see a couple of the BSO’s Wagner tubas being put to good use. Dennis Milford, all four of the trumpet players on the regular BSO roster were playing the Sinfonietta. But the work requires 12 trumpets plus two bass trumpets—as many trumpeters as first violinists—and so there were naturally a lot of extra players. I can understand Mr. Milford: First trumpet Thomas Rolfs was not in sight on Friday. Several other regulars were. Martin Cohn, Tom Rolfs was at the far audience-right end of the row of trumpets. I couldn’t see him unless I leaned forward from my side-first-balcony seat, and I’m not surprised that you missed seeing him altogether. I don’t review things very often, but this concert for me felt like a must, and I am expressing my views alone. The Haydn was for me good enough, the Mendelssohn with Mr. Rachlin was fleet and assured with the orchestra in fine form, but the Janacek was simply superb especially what for me is the finest performance I have heard of the Sinfonietta, which I’d wager will go down as one of the BSO’s memorable performances among the many. People who missed this due to the Arctic cold I hope can make a try for the repeat concert on Tuesday or tune in on WGBH next Monday February 11th. Simply not to be missed whatever is possible for you. The Brass in the finale is still ringing bouncing across my study walls with even the Northern vortex pausing to tune in. Thank you for placing the BSO trumpeters. I could not see them from 2nd balcony right.